* If you prefer, you can see a .pdf version here (4.23 Mb). Greetings from Japan. It has now been 5 days since President Obama’s visit to Hiroshima and the Memorial Peace Park, and people are still talking about this historic event. Many of our Japanese friends were greatly moved by his speech, which called for peace and a world free of nuclear weapons. However, despite their desire for peace between nations, many Japanese still do not know about Jesus, the Price of Peace, who offers peace between fallen humanity and a loving Heavenly Father. PLEASE PRAY that the Gospel would continue to go forth in Japan and that millions of Japanese would come to know this true peace that leads to eternal life. In early April we had the pleasure of hosting a short-term mission team from Cerritos Baptist Church who called themselves Team Hippo. As one of our supporting churches, we have had short visits from Cerritos in the past, but this time they served and ministered with us for 10 jam-packed days. 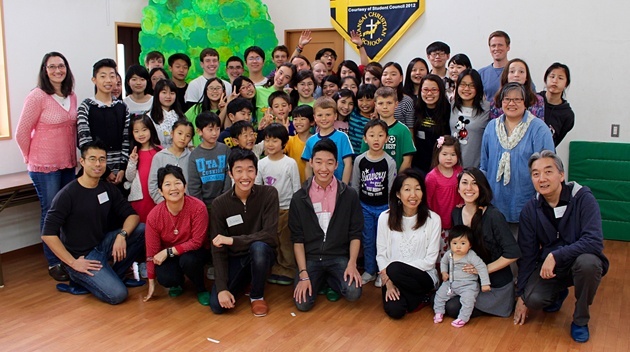 Their main ministry opportunity was at Kansai Christian School where they planned and led the annual Spiritual Life Emphasis Week (SLEW). Each Spring, the school has a week of achievement testing in the mornings, followed by spiritual enrichment activities in the afternoon. This year Team Hippo filled the afternoon sessions with music, games, testimonies, Bible stories, small group interactions and American snacks (yum!) The feedback from the KCS students and staff was overwhelming positive as they enjoyed not only the program but also building friendships with the members of the team. 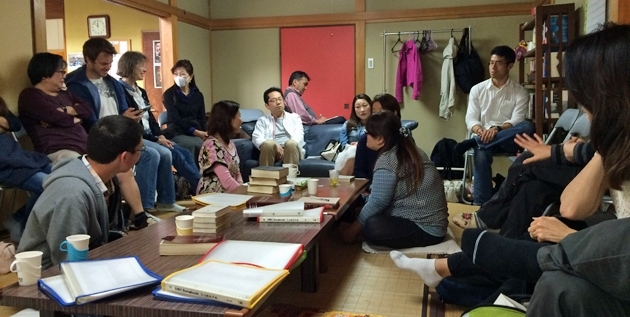 The team also led an after-school seminar for parents on the spiritual development of children. Although the turnout was small, the seminar provided a view of child rearing that is seldom taught in Japan. We also had the pleasure of having the team with us at Oasis Church for two Sunday in a row. Since the team consisted of 10 members, they almost doubled the size of our weekly gathering, which was a huge blessing for the church members. Japanese Christians are always so thankful when they meet Christians from other countries who are willing to come to Japan in order to help build up the Kingdom of God. On April 9th, Oasis Church and Team Hippo partnered together to put on our Family Easter outreach event. We started in the afternoon with a Children’s Easter Party at a youth hostel in Hamadera Park. Team Hippo took charge of this event as they led about 20 children (and their parents!) in games, songs and the telling of the Easter story. About two-thirds of these children were from non-Christian backgrounds, so PLEASE PRAY that the Gospel seeds that were planted that day would grow and produce eternal fruit in their lives. After the party, everyone then went outside for a quick time of worship, followed by a free barbeque dinner. Organized by the church members, this was a great time to hang out and fellowship with many of the visitors who had come to the Easter party. 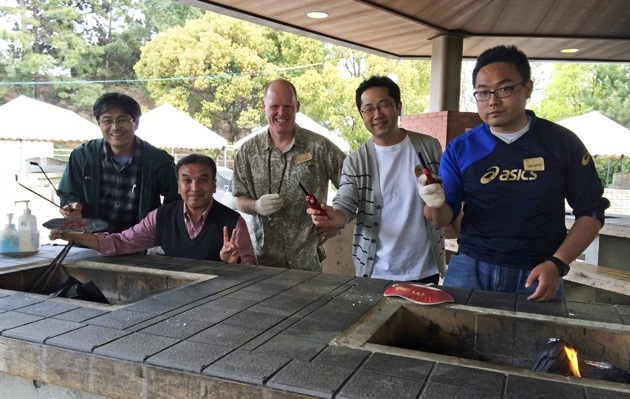 All in all, about 60 people attended the barbeque, and everyone seemed to have a wonderful time. We are really thankful for Team Hippo in helping us to put on such an event. Since Oasis Church is such a small gathering of believers, it would have been nearly impossible to do this on our own. When it was time for the team to return to the States, we were very sad to see them go. They were not only a great blessing to the school and the church, but also to our family. We enjoyed our times of fellowship with them and were greatly encouraged by their generosity and kindness towards us. We thank God for allowing us to serve together during these 10 days. One of Chris’s responsibilities at KCS this year was to serve as co-director for the school’s annual drama production. 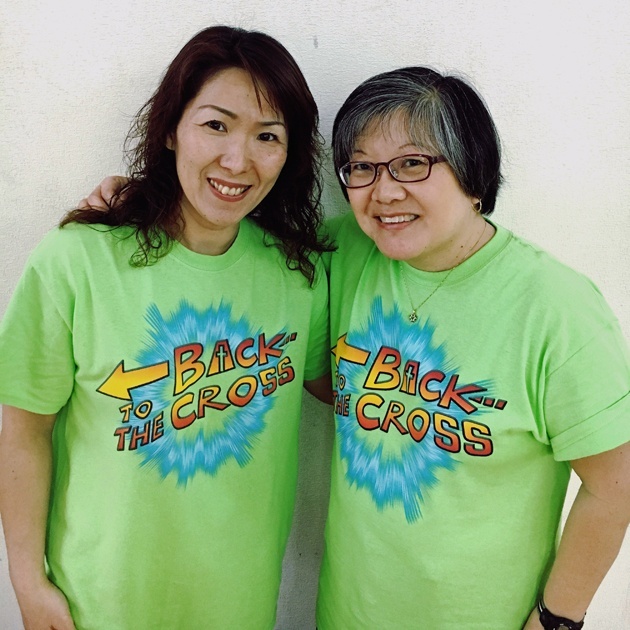 This year the kids put on a musical called “Back to the Cross,” the story of a group of children who go on a time traveling adventure and discover the true meaning of the cross of Jesus. For two months Chris rehearsed with the students, helping them to learn their lines and practice their dance steps. On April 29th all of their hard work paid off as the students took the stage at a local community hall and performed in front of over 100 people. The kids did a great job, and many people said that this was the best drama performance they have seen at KCS in many years. Praise God! So, while the drama is all finished, PLEASE CONTINUE TO PRAY for the many non-Christian family members and friends who were in attendance. Through the storytelling efforts of these talented children, may they also discover the true meaning of the cross. The entire cast of "Back To The Cross"
On a more personal note, the school year will end for Chris and Luke on June 10th. Chris has enjoyed her first year as a full-time teacher, but is ready for a bit of a break this summer. However, her break won’t last for long as she has enrolled in an on-line class from a university in America. The class is called “How to Teach Reading and Writing to Elementary Children” and will run from late June to early August. PLEASE PRAY that this class will provide Chris with the necessary tools and skills to better teach her students when the new school year starts in the Fall. Finally, PLEASE ALSO PRAY for Chris as she will also make a quick trip back to the States in August to check in on her parents. With her parent’s diminishing ability to communicate well (both are suffering from dementia), please pray that Chris would be filled with the peace, patience and love of Christ. May the Lord give her wonderful times of conversation with her mother and father. Well, that’s it for now. Once again, thank you for your faithful prayers and support.